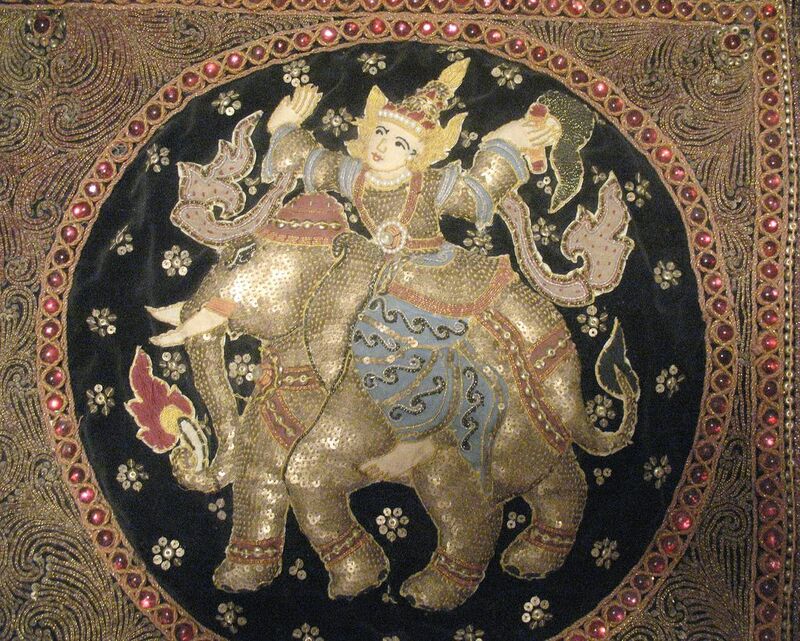 This is an old Burmese Tapestry of absolutely gorgeously decorated figures riding elephants. 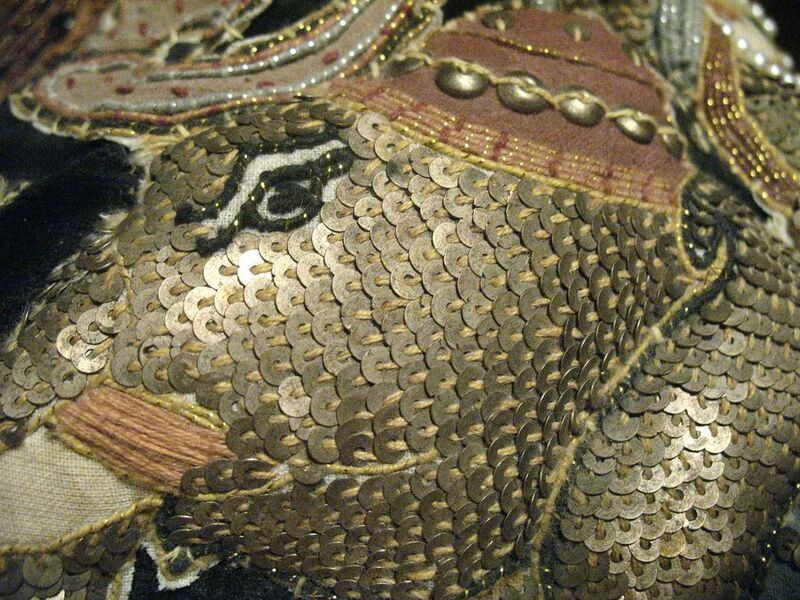 It is entirely handcrafted with a multitude of beading, sequins and metallic threads. The work is extensive and beautiful. 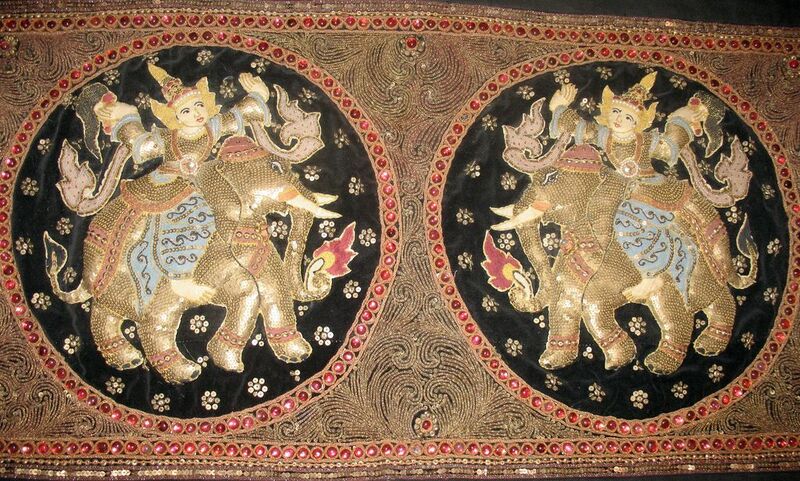 The tapestry is large measuring 37 1/2" in width by 24 1/2" in length and has been made with a three dimensional shaping. It also has many beads around the edges along with pearls around the figures.It is vintage and I was told it was from the 1960's. I can find only one reddish colored beads missing from the edge along the bottom area, hard to detect, otherwise,it is in good condition. It can be hung with a wooden dowel, curtain rod, or, evenframed. 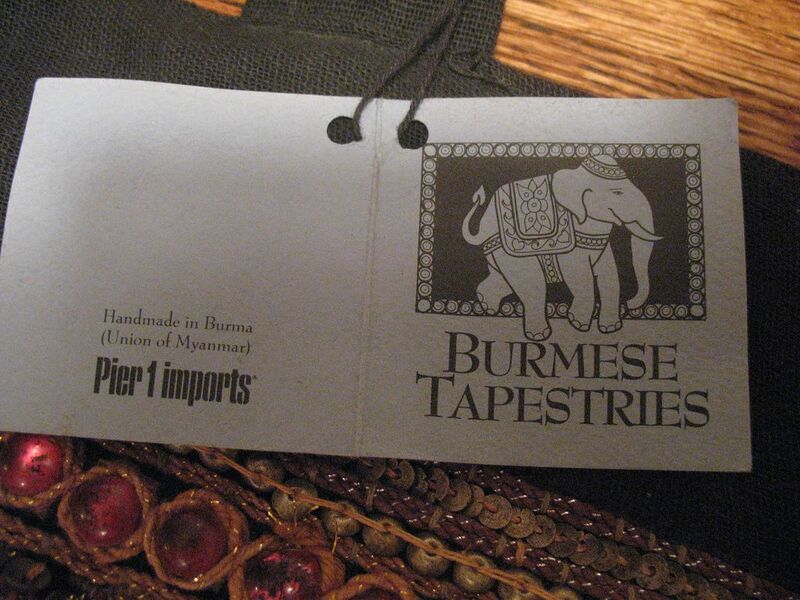 Because of all of the various handcrafted elements made into this tapestry, it is very heavy. Some information on this beautiful tapestry is as follows:Burmese tapestries (kalagas) are intricately handcrafted by processes unchanged for more than 150 years.The sequins are formed by cutting brass wire into rings,which are individually hammered on an anvil. Beads are made by cutting glass into small squares and melting them in a small wood-fired oven. Metallic thread is createdby twisting together fine wire and colored yarn. A master artist draws the figures on cotton cloth, and components are combined by hand-stitching. It is not surprising,considering the high quality of craftsmanship, that each small tapestry requires severaldays work, larger ones, up to several weeks.